Please Note: CarbonTracker-CH4 is very similar to CarbonTracker-CO2. This tutorial gives a simple explanation of how CarbonTracker-CO2 works. CarbonTracker is a system that calculates carbon dioxide uptake and release at the Earth's surface over time. It estimates the carbon dioxide exchange from an 'atmospheric point of view'. Since CO2 mole fractions in the atmosphere reflect the sum of all the CO2 exchange at the surface, they form the ultimate record of the combined human and natural influence on greenhouse gas levels. A simple analogy for this approach is your monthly check-book: by looking at your bank statement you know exactly how much money you have in your account on the 1st day of a new month. The challenge is to reconstruct the sum of income and expenses since the last month that matches your total exactly. 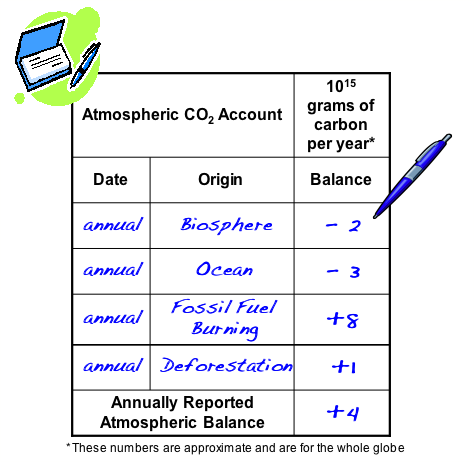 For the global atmospheric carbon dioxide budget, this check book looks something like the figure on the left. By measuring carbon dioxide frequently (the bold-faced sum that makes the total), and at many places on Earth, CarbonTracker can break down the budget even further, and thus keep track of uptake and release for many places on Earth. And just like your bank statement, the atmosphere never lies! CarbonTracker produces model predictions of atmospheric CO2 mole fractions, to be compared with the observed atmospheric CO2 mole fractions. The difference between them is attributed to differences in the sources and sinks used to make the prediction (the so-called 'first-guess') and the sources and sinks affecting the true atmospheric CO2. Using numerical techniques, these differences are used to solve for a set of sources and sinks that most closely matches the observed CO2 in the atmosphere. CarbonTracker has a representation of atmospheric transport based on weather forecasts, and modules representing air-sea exchange of CO2, photosynthesis and respiration by the terrestrial biosphere, and release of CO2 to the atmosphere by fires and combustion of fossil fuels. More details about these different components and why they are needed can be found in our documentation pages.